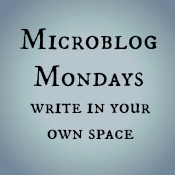 I started writing my Monday morning post, but the several blogs I’ve read the last day or two all provided such great inspiration that I knew it was impossible to stick to eight sentences, so today I’ll write my Microblog Mondays post, and then another later in the week – keep a look out for it! Today I wanted to note again one of the great joys of my No Kidding blogging life, and that is meeting other bloggers. I meet you all online, which is truly special, and I feel as if my life is much broader than it might be, simply because I chat with you all on a regular basis. That, it turns out, is the top factor contributing to longevity, so I thank you all in advance! Last week I had the pleasure of meeting Valery, her partner and her beautiful daughter, as they are on their tour of New Zealand. We sat under a pohutukawa tree beside the beach, as Suzy fearlessly climbed on the playground and the trees, and chatted face-to-face after all these years of chatting computer-to-computer. We’ve learned each others’ real names, and got used to using them! I look forward to the day when I can do that with many more of you.